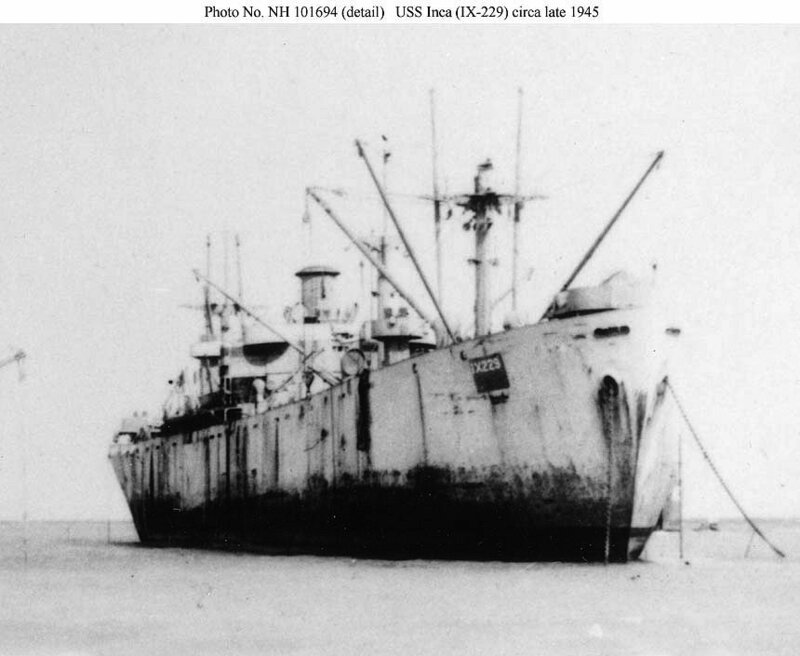 Laid down, 24 July 1943, as SS Henry L. Abbott, Maritime Commission type (EC2-S-C1) hull, under Maritime Commission contract (MCE hull 2063) at Oregon Shipbuilding Corp., Portland, OR. Delivered to the Maritime Commission, 19 August 1943, managed by the Alaska Transportation Co, Seattle, WA. 44k Inca (IX-229) aground in Buckner Bay, Okinawa next to a small floating drydock after they were blown ashore by a typhoon 9 October 1945. Another "Liberty" ship is in the left distance. In the original image, Inca's hull number (IX-229) is clearly visible in the dark patch on her starboard bow. 67k Close-up view of Inca (IX-229) aground in Buckner Bay, Okinawa. The hull number IX-229 is clearly legible on the bow, indicating that the ship's crew was unaware in October that the ship had been redesignated Gamage (IX-227) by the Navy Department back in August. News of this change does not appear to have arrived in the Western Pacific until January 1946. This photo was taken by an Army Air Force dental officer, Herbert F. Gabriel, who probably visited the site relatively soon after the end of the war. 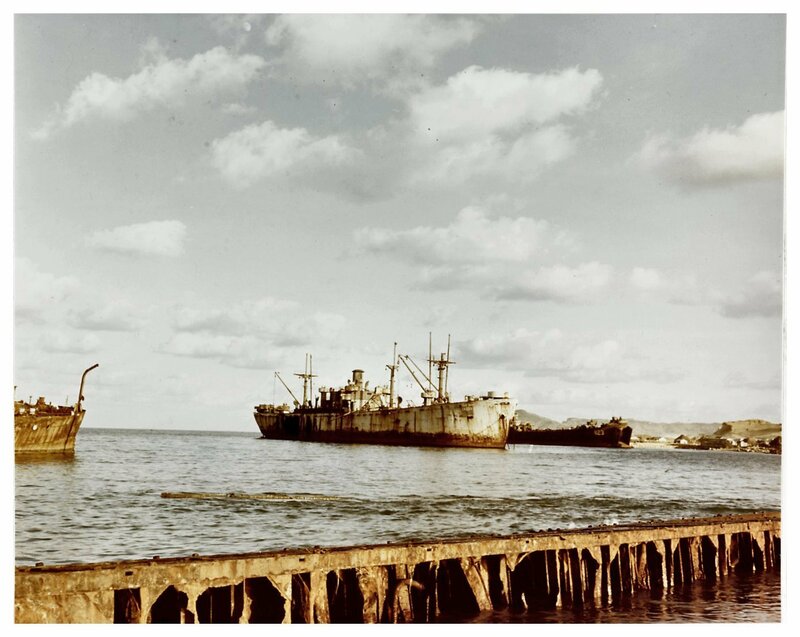 63k Inca (IX-229) (renamed Gamage (IX-227)) and USS LST-823 aground in Buckner Bay, Okinawa, after being stricken from the Naval Register in early 1946 and before their removal by scrappers circa the late 1940s. Inca served under this name and number into January 1946, when local authorities learned that she had been redesignated Gamage (IX-227) in August 1945. The hull number barely visible on her bow is probably IX-229. 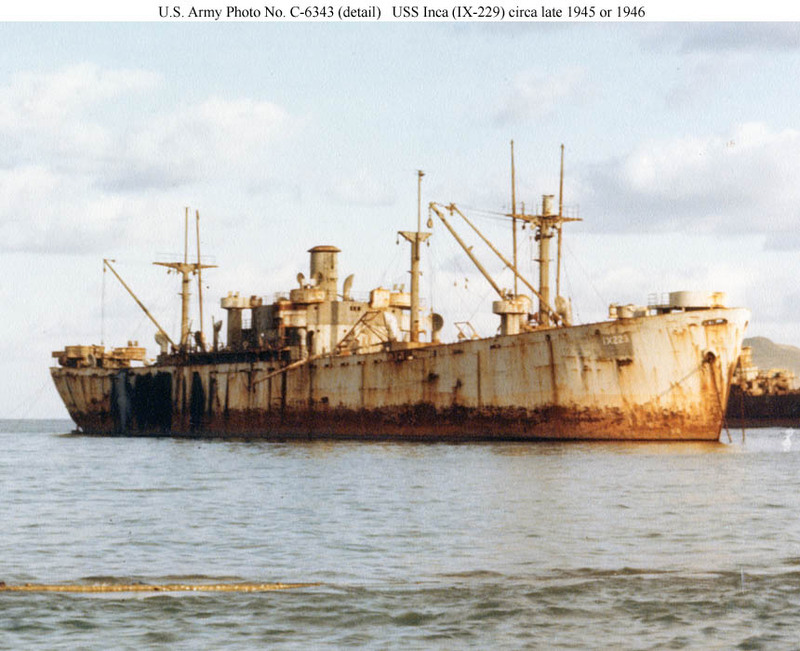 122k Close-up view of Inca (IX-229) aground in Buckner Bay, Okinawa, after Typhoon Louise ravaged the harbor there on 9 October 1945. 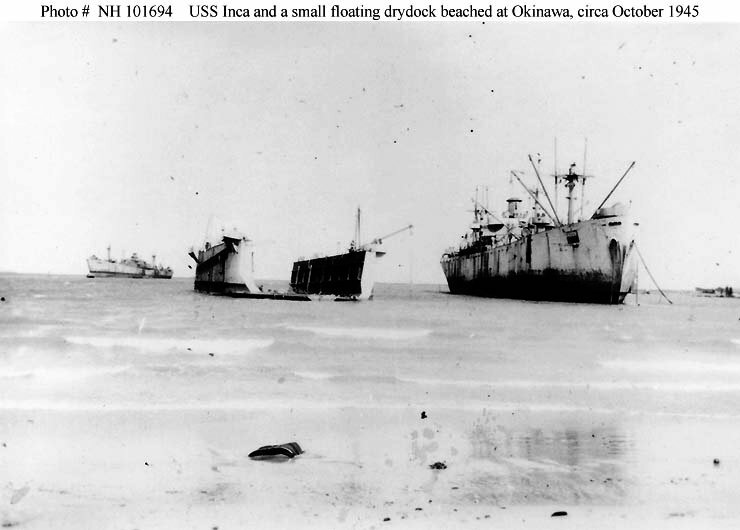 The wreck beyond her on the right is USS LST-823.